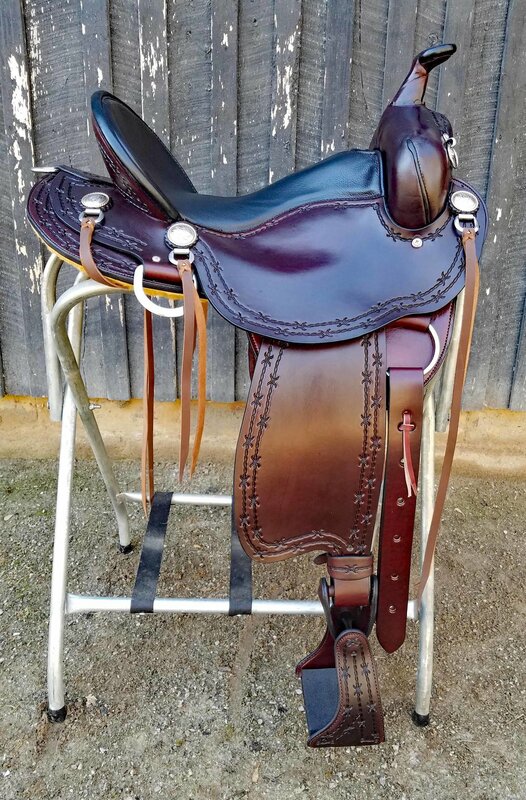 This is a beautiful Eli Miller Custom Made Trail Saddle. Built on a Custom Batie Tree, it has flared “J” bars which allow for more room and freedom in the shoulder. Most gaited and trotting horses alike will move better with this saddle. Especially when asked for increased performance, collection and agility. Trail horses are asked to travel on rough terrain while being surefooted, pack riders up and down steep hills and spend many hours moving. It makes sense to help them be as comfortable as possible and the Batie Tree offers that. It is the only tree that we will use. We had this saddle custom made to our specifications to fit many of our customers' needs. The padded 16 inch seat will fit most riders. 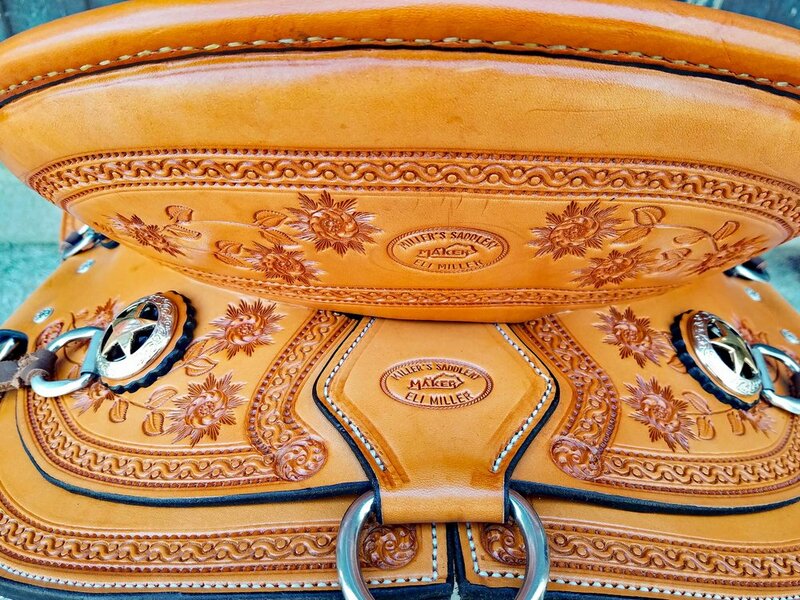 I added a pencil roll to the 5” cantle for a more Western look and enhanced durability. The saddle has heavy duty stainless hardware and dees for your saddlebags, Western or English style breastplate and miscellaneous equipment. I really enjoy the dark oil color with the contrasting smooth black leather seat. The tooling is hand stamped with the double row barbed wire border as a beautiful accent. The fender is a full western style with more flexible leather to reduce knee strain on those long rides. The stirrup bars are much freer than many Western saddles. You can move your leg freely, forward or back. I appreciate that enhanced ability to use my legs properly. Another added feature is the built in Back Rigging that allows you to have a fully functional rear cinch. A much needed piece of equipment on rough, hilly terrain. 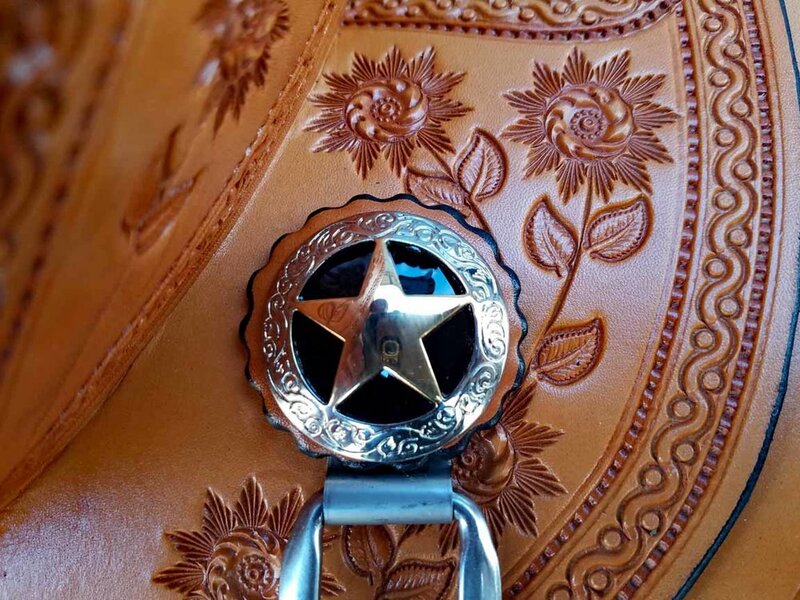 This saddle is lighter than most western saddles, allowing for ease of saddling. I love that it is easy to throw on taller horses but still has the quality and craftsmanship that I demand. The ground seat has a nice pocket that holds you in but does not restrict movement. The whole saddle has good feel and nice contact allowing for better communication with your horse. Many riders switching from English to Western will appreciate the contact, flexibility and the weight of this saddle. 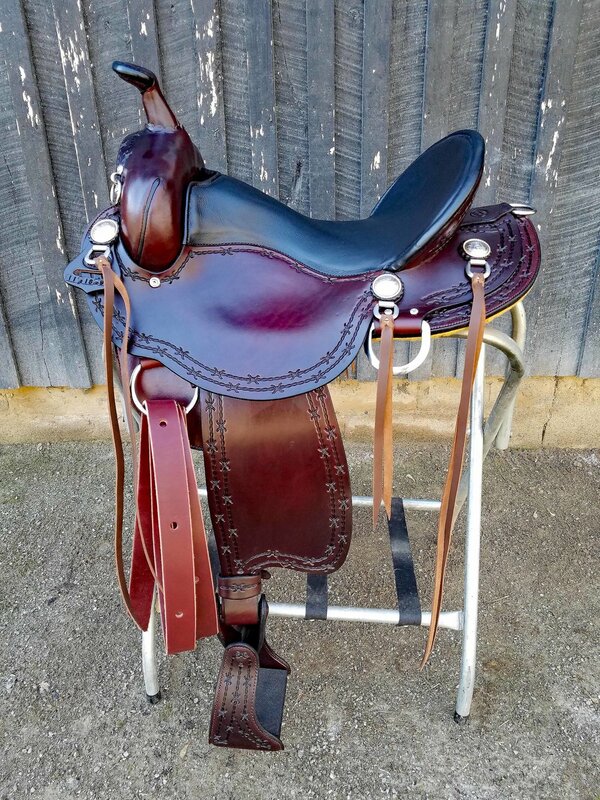 We can make a custom saddle with different options if desired, give us a call.